Several A-Cat builders supporting their local classes in Boat Shows around the World. A truly great sinergy between the Associations and A-Cat brands. 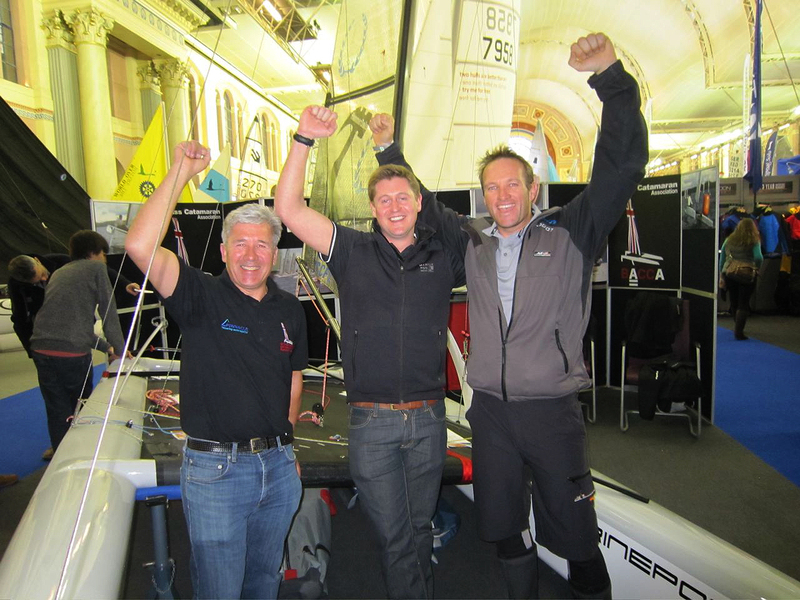 This Time the Vision by Catamaranparts.nl / Saarberg at the London Dinghy Show. Top Class sailors Chris Field and Mischa Heemskerk were there too promoting the Class. 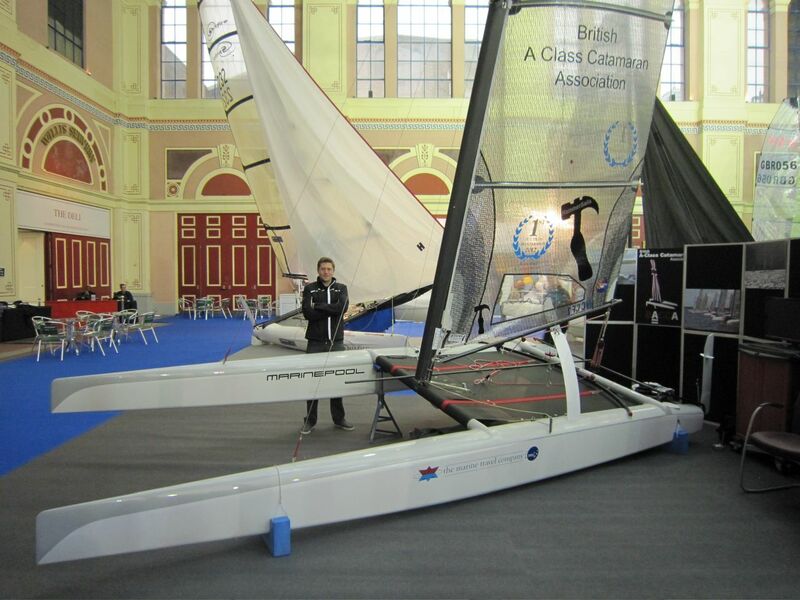 "This year the Association are displaying the hugely successful Vision A-Cat from Catamaranparts.nl. After two seasons of intensive prototype testing, the Vision in the capable hands of top flight British sailor Chris Field has returned many successes in 2012 culminating with Chris being Crowned European Champion at Garda last June against a fleet of almost 100 world class sailors. The long awaited production Vision in its new two tone paint scheme is built intentionally to 72kg allowing for owner preferences to bring the boat up to the class minimum of 75kg. Its partial non-slip paintwork to the decks also alleviates the need for additional tape being be applied for that extra grip. In many instances the Vision follows current A Class design trends, curved daggerboards providing lift and rudder blade winglets providing additional stability when downwind are standard options but looking deeper into the hull design the Vision has successfully bucked the trends followed by other manufacturers Catamaranparts have intentionally adhered to the CEB bow shape opposed to the wave piercing trend followed by many current day manufacturers. This gives the platform a somewhat retro appearance but non the less does not detract from its lightening performance. The boat will be shown with the latest all carbon Saarberg mast and the Carbon Kevlar Maxx sail from the A-Cat specialist Hammer Sails."